Each dot represents the number of complete spontaneous bowel movements (CSBM)/week. Note how many people had zero bowel movements per week before the study started (baseline). Paticipants were between 18 and 75 years old and reported mild to moderate constipation. Before any intervention, people were averaging about 1.7 bowel movements per week. While taking psyllium (Metamucil) that increased to 2.8 times/week. On prunes it increased to 3.5 times/week. Prunes won, don’t tell Metamucil. 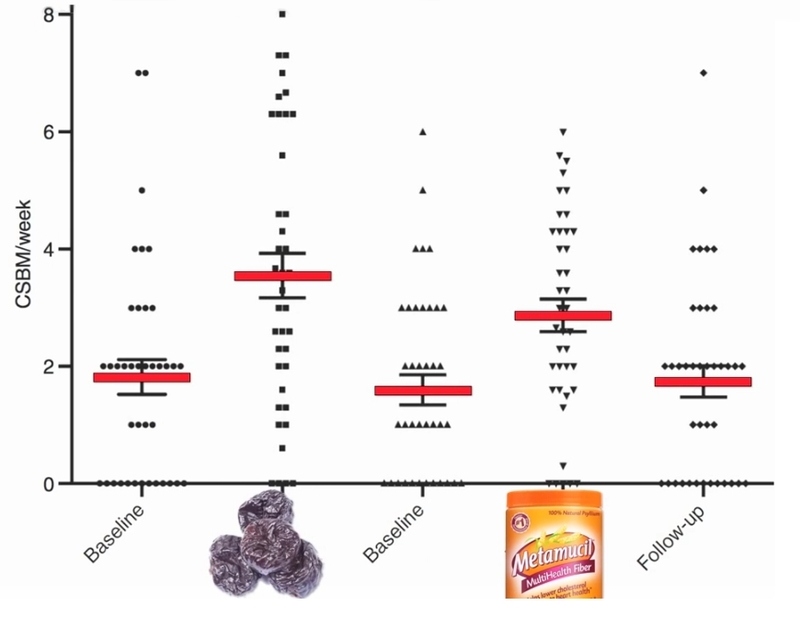 Conclusion: Dried plums are safe, palatable and more effective than psyllium for the treatment of mild to moderate constipation, and should be considered as a ﬁrst line therapy. Where do vegans rate? Going, going, gone. Not 2, not 3, but 10.9 [bowel movements] a week. This entry was posted in Uncategorized on April 9, 2018 by Bix. Interesting. I love prunes, have a bunch, and am thinking of eating some raw and some as stewed prunes, 2 tbsp psyllium seems like a huge amount. When I was growing up we called them prunes. First time I heard “dried plums” I didn’t know what they were. Also, when I was a child, when we went out to a restaurant, you could usually get a side of stewed prunes, and I did not know what in the world the adults were thinking. It’s 1 tablespoon Metamucil, twice a day. I updated the post. Do you think “dried plums” is an attempt to make prunes seem more interesting or palatable. A lot of people hate prunes, though as I said, I like them. I do. “Prunes” seems dated. I haven’t had any in like forever so I bought some to stew. They’re so good! I have another favorite food.